The idea for this creation was not my own. Lorraine Pascale, former model and now a television cook, made it on her show. With a little cynicism I decided to try it out and see if the recipe is worth attempting. Unfortunately, having left the bulk of the dishes from last night’s fish extravaganza still soaking in the sink, my lunch has been somewhat delayed. I have put my own twist on the said recipe. I don’t have any basil so I am using a little dill instead, but Lorraine would be the last person to condemn an improvisation. In my mind’s eye, I see her smile of approval! I place some cherry tomatoes in an oven proof frying pan with a little oil and a smidgeon of honey, and season to taste. Then I sprinkle breadcrumbs over the tomatoes to soak up access liquid. I roll out some shop bought puff pastry and roll it on a well floured board to the diameter of my frying pan, which is five inches. It goes in the oven for 20 minutes at gas mark 6 until golden and puffy. Leave to cool for a few minutes and turn out onto a plate. There is quite a lot of liquid and the pastry is quite soft on top, so I place it back into the oven to ensure that is cooked and not soggy. 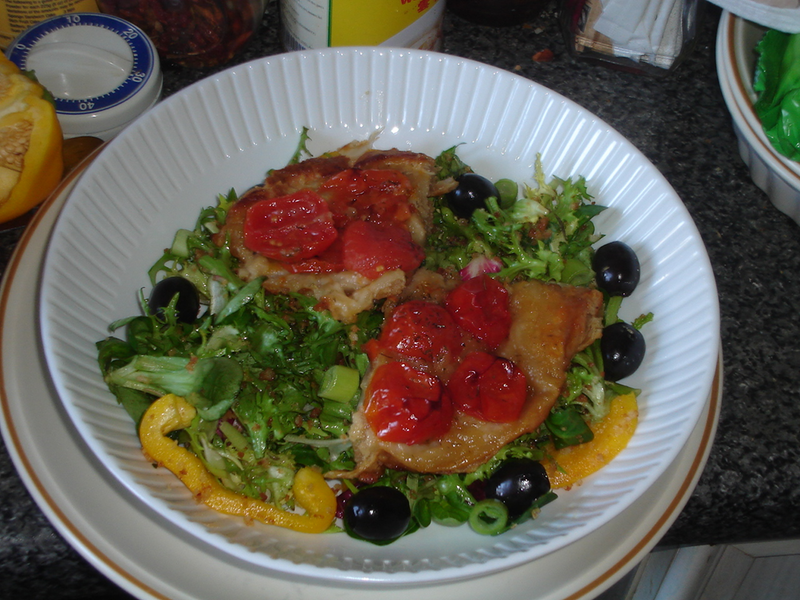 To accompany the tomato tarte tatin- a salad with an oil, mustard and cider vinegar dressing in the proportions of 1:1:1. If you don’t like dressing too acidic, add a little sugar. For me. it looked nice and once cooked through tastes nice, but a lot more description is necessary. Call me a traditionalist but tarte tatin as a dessert works in many different ways that its savoury brother does not. Still, not a bad dalliance for a Saturday afternoon on my own. Better than shopping in Aberdeen, which would my idea of purgatory!